This is hilarious. Pease (the PI) will definitely try to dump all of the blame on Anumolu (grad student, graduated 2012). It’s pretty amazing how poorly photoshopped these images are. Pease is either profoundly stupid (Anumolu clearly is) or goes to great lengths to not read his own groups’ papers. Either way, both of their careers should be over. What’s especially sad is that this work is trash even if it were not complete fabrication. I personally know the 1st author and would like to believe this never happened. But i guess we’ll have to wait for the U investigation. It will be very hard to see if prof takes any responsibility. I don’t think the student would have the courage to do this without prof knowing it or him forcing them to do it. Maybe this part of the issues will never come out in open. I know Dr. Pease as well and am surprised he would be involved in something like this. My personal opinion is his student did it and Dr. Pease didn’t catch it (although one could argue that he should have). I guess we’ll see what the investigation determines. Well, at a quick glance (and that’s all I’ve given it, I admit), the amazing thing is that it went through peer review. I’ve published in Nano Letters and I was impressed by the rigor with which our paper was treated by the referees (I think we had 3 independent reports that time), and the sensible and useful suggestions they made. I’m therefore surprised and disappointed by this, as the images look very crudely altered, even if you just look at some of the ones at original size in the figures in the main text. Simon, no surprise to meet you here. I generally agree with you on the usual rigor of this journal but I would also want to defend the referees, whose job is not to look for fraudulently generated data (it wasn’t me, though). Their assumption has to be that authors adhere to a certain code of practice and present their genuine data. Had the fabrication of data been done by a professional artist or even any somewhat more diligent individual, nobody would have possibly been able to notice it, which would not have made it any more acceptable, of course. The question to be asked is why authors engage in this criminal activity, not how it is possible that the referees do not notice it. The images could have been very small, and the reviewers had no reason to inspect them very carefully. All they meant to show was the angle between two black sticks, and this can be seen without zooming in. If the reviewers had examined the images of the rods with these types of question in mind then the amateurish Photoshopping would have been discovered before publication. I agree that the referees should really have seen this. I do not agree that this should be their responsibility, though. With the current data processing standard anyone can fake data in a way impossible to detect. It cannot be up to the referees to evaluate if data are real or fabricated, as this would be an impossible task. Of course, here, I mean, it all still looks to me like a hoax. Fair point, Mathias. If the authors had spent a few more minutes to do a better job of the image manipulation then there is no way that the referees could have spotted this and we can’t expect fraudulent data to be detected as a matter of course. Wow, that is a stunningly bad photoshop job. I hope the authors are really social scientists doing some sort of study of the lowest level of garbage they can pass through peer review. I agree with comment #1 – assuming that the corresponding author blames his coauthors, I don’t know how he could not have detected the manipulation of these images in a group meeting, in hard copy, and/or in the publication file. Asleep at the wheel at best; faker at worst. You are referring to the infamous Sokal hoax (http://en.wikipedia.org/wiki/Sokal_affair). I always wanted to do this in science and found it cannot be done due to the way science works. The only way around it would be fraud, but what does this show other than that the reviewers trust the authors? If you wanted to test the system, you would have to give an extremely outlandish interpretation to real data, and not an obvious one to fake data. The most troubling aspect about this (to me anyway) is the threat of legal action for making this public. Liars will lie. Sometimes they will get away with their lies, but it is in the greater good of the scientific community that abnormalities like this be found, acknowledged, and reported on. Thanks to Mitch for bringing this to our attention despite the (likely spurious) threat of litigation. 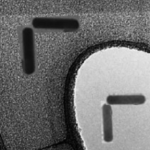 It seems like all the TEM images are highly suspicious… not just in supporting information but also in abstract and figures in the main text. Also, their poor photoshop skills let me wonder how can they think that they can fool scientists like this?! How can they just get away so easily? It is not their first time either. I might understand this slipping by the referees if they were relying on a printed copy of the paper or an electronic copy with a poorer resolution image for their review. On the other hand, the subject matter would demand that they take a close look at these “chopsticks” so I don’t know how much of an excuse that really is (I’m not in the field of nano-stuff). What I find curious is that Anumolu is listed as the corresponding author instead of Pease. It may be possible that Pease did not approve of the paper’s submission and publication in Nano Lett. For all we know, this may have been the original motivation for Utah’s investigation instead of the image manipulation. This depends on the customs of the group and of the PI. My PI actually offered me to be the corresponding author of all the articles I have published as a first author during my PhD. I think the reviewers (and the journal) did the correct thing in publishing this paper. The fraud is so obvious that the only way to properly expose the authors is to publish the article. If the editors just rejected the paper and admonished the authors, then how would this be properly exposed? In all likelihood, it would all get swept under the carpet. The journal did the community at large a great service by accepting and publishing the manuscript. I noticed that this work was done at the University of Utah, where the infamous “Cold Fusion” experiments were performed (Pons and Fleischmann; http://en.wikipedia.org/wiki/Cold_fusion). My advice to the Ute team is to start drinking heavily! The Iron Chemist – the point about starred/first authorship is a good one- let’s wait and see. Anumolu’s CV found online has this (apparently) in preparation in 2011, no co-author; graduated in 2012, no recent activity. Strange? to be just… he did not put english .. This is pretty bad; at least the fabricators should have done a better job. On a more positive note, it’s heartening to have a Senator commenting on this site. Just when you think politicians have lost all interest in science there appears a ray of hope. Thank you to Senator Blutarsky. Well, he didn’t say fluent speak in English, so he could be okay in the other four. Plus, it’s a small mistake and easy enough to make. 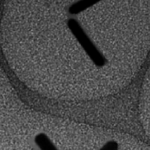 Not my field and I might be wrong but all rods on the left pictures (fig.4 and supporting info) looks about 10nm long if compared to 30 nm scale while on all right pictures rods are about 60 nm – same length as 60 nm scale ! Should it not be opposite – left pictures are zoom in, right ? 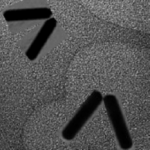 @ sgcox The left images were meant to be of rod-shaped quantum dots and the right images were meant to be of nanorods. The sizes are approximately correct for the materials they said they were working with. @the iron chemist: it is certainly unusual that a phd student would be corresponding author, but that doesn’t get the PI off the hook. I once submitted a paper to JACS while still a PhD student as corresponding author (my PI was ok with that). Before the editorial office would process the paper they asked for an ok from my PI (via e-mail). At the time we assumed that this was a standard procedure because they had PhD students submitting papers without the consent of the PI sometimes. Not sure Nano Letters has the same policy but it might be possible since it’s also an ACS journal. 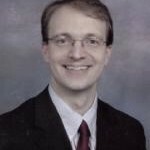 @Simon Higgins (1st comment): not sure I’d agree with the high quality of the peer review at Nano Letters… I think we have submitted 4 papers in total during my time as a PhD student and we had experienced the full range of quality when it came to the refereeing process. (The scale going from 3 thorough referee reports to paper rejected/accepted without peer review). 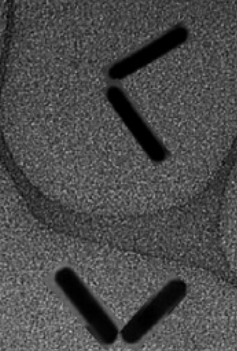 I’ve taken, seen and analysed thousands of bright-field TEM mages and these are very inconsistent with the contrast you’d expect to see in the microscope. The amorphous film shows a step in thickness (where it is darker) and there is a bright Fresnel fringe at the edge of the step. This tells me the film was imaged at underfocus. This would explain why there is so much random phase contrast in the film- the objective lens is defocused by, I would say, a few hundred nanometers. If that was the case, there should be Fresnel fringes around each nano rod too, whether it was on the top, bottom or within the film. There are no fringes there. 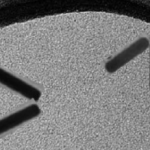 However, Fresnel fringes could be absent if the coherence of the electron beam was poor. But this would be inconsistent with the phase contrast of the film! Either way, there is no electron beam instrument that I know of that could generate an image like that in a single take. Mr. Pease has removed the “chopsticks” paper from his personal biography, assuming it was listed there to begin with. 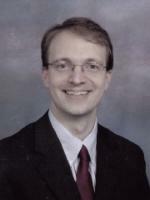 I am an attorney, a member of the First Amendment Lawyers Association, and a blogger. As a blogger, I write about bogus legal threats against bloggers, the Streisand Effect, free speech, and internet culture as it relates to legal threats. I also use my connections to find pro bono legal representation for threatened bloggers. If you receive any specific threats, or would otherwise like assistance, do not hesitate to reach out to me. Well, I guess that the funding agency for this work will do an investigation through their OIG office? One day after class, I asked Leonard J. Pease III about his research. Many profs would have been enthusiastic: Pease sneered, told me he didn’t have time and walked away. He acts like he’s too good for Utah–the truth is he’s not a good enough teacher, or nice enough person to be here. Rest of the ChemE dept is great; he’s just a bad apple. Do they still have a job? I believe the Editors and Reviewers of this paper have, to some extent, some responsibility if this paper have been finally published in such a high prestigious journal. It seems to me that they didn’t “review” the paper in proper detail, at least, in the level of detail we actually did to spot this presumably manipulated images. I find it very hard to believe that your paper got accepted without peer review. If it was rejected by the editor before sending it to reviewers, that is normal procedure. Not all papers make it to peer review in Nano Letters. For acceptance you need comments from reviewers and in my experience the reviewers have done a good job. I believe this article went through the review because reviewers were looking at poor quality and/or not zoomed in picture. If you don’t zoom in, the manipulation is not as obvious. I think its a full mistake by reviewers. As far as I know , the figures in a paper come for review has 600 dpi resolution. Just by a bare look, it seems that images are cut and paste at right angle. Now my question is that why reviewers could not detect it although they agreed to review th paper by following the ethical guidelines? It is really hard to find the PS details since not everybody enlarge to 100% and check the pictures. 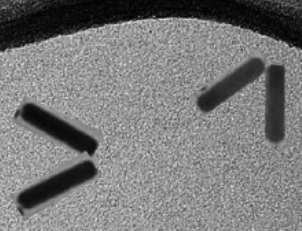 I know many people in nano materials or nano-assembly fields use PS to make their picture “perfect”. A “normal” method is choosing the “perfect” (or what they want) picture to represent the sample although the picture only can represent 1% or even lower percent of their sample. Choosing the “perfect” image is not the same as using photoshop/paint to plaster nanorods all over a TEM image. Any image manipulation by an honest researcher should basically involve only annotating the image, or adjusting brightness to make the structures easier to see. The goal of researchers is to demonstrate (real) success and report how the success was achieved, as accurately and succinctly as possible. Readers care about understanding the work, and learning how to replicate and improve the rate of success; dwelling on the failures is counter productive. Best scientific joke of the year! Who said scientists aren’t humorous? 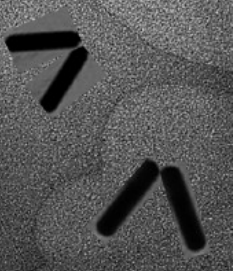 BTW, didn’t anyone notice that some particles are floating in holes on the carbon film? It’s probably not “Cryo-EM”, which means those particles are floating in the vacuum! The reviewers should be banned for life because of their incompetence. And what do you suggest for the authors? I feel bad for LFP’s research group. The grad students who have worked with him for several years are in a seriously bad spot right now. Imagine spending two years with this clown as your advisor and then seeing this. He can’t stay at Utah after this, even if he’s not fired, he’ll never get tenure. Meaning several innocent grad students just got screwed and a bunch of undergrads are out of a great part-time job & research experience. I completely agree with you. I am in the field of plasmonics. The same message I got thrice in my career, and a couple of times it was 20 days for the editorial decision only. This journal is a bull**it and is intended for editors and their friends only. The editors should take the responsibility of such retracted papers. lonely PhD and Reaercher, folks, you cannot be serious here. The paper is not suddenly bad. The results presented are fake. This is why it was retracted. The editors cannot carefully look at every submission to check for fake data. Indeed, had the authors done a better job, it would have been impossible to see that the data were fake. Only they are to blame, not the editors and not the reviewers, although the latter, one can argue, should really have noticed it. Now, the criteria, there is of course an element of editorial choice, and thankfully, there are other journals of similar scope and reach. I am not surprised that an editor would like this paper, since the ability to do what the authors have claimed to be able to do is novel, interesting and potentially important. I do not think that the authors were chosen as friends or close colleagues of any of the editors. The work itself looks relevant and interesting, in fact, this is the only thing they did well, the choice of what to fake. Even if the results were to hold up, doesn’t the topic seem a little gimmicky? Sort of like all those nano-papers where they were making little nano-men and spelling out their institution’s name. Well, yes, perhaps. On the other hand, controlling the angle of assemblies of rods is quite a high level of control and unprecedented. The next step could be to look at plasmonic properties, SERS etc. I think it would be well within the scope of the journal and of significant interest. Let’s look at the supporting info of another paper published by the same professor and student. The supporting info is free. If you enlarge and look closely at figure S2 (c), you could find at least two spots that were blurred/covered. One spot is oval shaped and the other is a square. This is pathetic on the part of the authors!!!! Figure S2 (c), A Square!!! “President Pershing has received your e-mail and would like you to know that we have, indeed, just learned about this and are taking appropriate actions in accordance with our research misconduct policies. What about the NSF and NIH program managers? Don’t they also have a responsibility to look into potential research misconduct? NIH & NSF have their own offices that handle misconduct investigations. NIH’s is called ORI for Office of Research Integrity. I think they only have jurisdiction if the work was funded by them or appeared in an funding application they received. Typically, their roll is oversight of the in-house investigation at the university, not their own independent investigation. They can then ban people from receiving, applying, or reviewing funding proposals. I guess I mention NIH and NSF because I believe that these grants were acknowledged in the manuscript. Broadly, who is responsible for sorting out a mess in the case of misconduct is more the question. Obviously the person/PI who did the misconduct should be punished (or whatever you want to call it) but where does the buck stop after: The University, the funding agency, the journal, accrediting board for Utah, etc. In this case, since the University is doing an investigation, is that all that is necessary or should someone else follow up too? Its my understanding that the ‘buck’ stops at the university. The institution is responsible on ‘sorting things out’, with the NIH, NSF, or whoever paid the bills responsible for oversight of the investigation (in the US, of course). A final report will be prepared by the university and sent to the funding agency. They review it and either say ‘you did the investigation right’ or ‘go back and do it right or your institution will face sanctions’. There isn’t a school in the country that wants NIH sanctions, so there is some incentive to do a rigorous job. All US R1 schools should/do have someone in the position of ‘research integrity officer’ (RIO) or some equivalent title that conducts the investigation, collects evidence – both physical, electronic, and sworn testimony. The key individuals (accused, accuser, witnesses, etc.) will have the chance to make statements. RIO’s are typically college or university level officials, they may or may not currently be faculty. Lawyers will get involved at some point. Some places will assemble a panel to review the case, and typically that panel should have one member at the rank of person being investigated. So if its a post-doc, some other post-doc will be on the panel. The frustrating thing to the community is that the results of these investigations may not be made public for quite some time – until the NIH or whoever gets around to reviewing and approving the final report. If it is NIH, the results (in cases of a finding of misconduct) are posted on ORI’s website. If there is no finding of misconduct there’s no announcement. I predict there will be a finding in this case, its just a question of who bears the brunt, I’m guessing its RA in this case – he’s the first AND corresponding author. You are correct. The University is responsible under federal regulations for conducting the investigation, and for cases related to National Institutes of Health (NIH) funding, to inform the Office of Research Integrity (ORI) about the initiation and outcome of the investigation. ORI then reviews the investigation report, asks the institutional officials questions or for more information or for further investigation of the matter (or about related research) by the accused party (called the respondent). Then ORI decides whether to pursue findings of research misconduct and administrative actions against that person (including oversight of their future NIH-supported research or applications for NIH support, or debarment from making such applications or research using NIH funds. If the institutional officials have not requested that the editor publish corrections or retractions of the papers found to contain falsified, fabricated, or plagiarized material, ORI may get the respondent to do so, or ORI will inform the editor about the apparent need for such action by the journal, which the editor and publisher can pursue. NOTE: ORI has not been part of NIH since 1992. ORI is at the same level as NIH in the Office of the Secretary of the federal Department of Health and Human Services (HHS). ORI’s findings are approved by the Assistant Secretary for Health in HHS, not by NIH. Nepotism is rampant in NL, start from the top! What if the editor /reviewers noticed it but just didn’t want to point it out because of any political reason ? Why is Pease still employed at Utah?